Vision—the last of our senses to fully develop, it’s also often the first to fade. With over 200,000 new U.S. cases reported each year, macular degeneration disease is a common cause of that fading, particularly among people 60 and older. While challenging, a macular degeneration diagnosis doesn’t have to mean the end of a life you love. Whether you are a homebody or continuously on the go, with the right magnification tools, you can continue to get things done—in all parts of your life. Hobbies. Many senior adults enjoy hobbies that require clear eyesight. Macular degeneration causes a loss in the center of the field of vision—dry macular degeneration causes the center of the retina to deteriorate, and wet macular degeneration causes leaky blood vessels to grow under the retina. 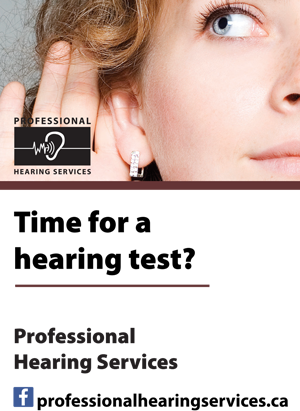 Symptoms include blurred and distorted vision, partial vision loss, abnormalities like seeing spots and straight lines appearing wavy and an inability to see in dim light. Experiences like needlepoint, crafts, crossword puzzles and even watching television are all diminished significantly when macular degeneration progresses in the retina. Enter the LED Magnifier, with its scratch-resistant lens that brings details into sharp focus and its energy efficient LED-lit handle that allows you to read and work in the dark without disturbing a sleeping partner, while also shining light on and magnifying spaces that are difficult to see. You’ll be able to perceive minute details more clearly and once again enjoy past times that enhance your life. Reading. Retirement is a great time to catch up on the latest bestseller or the daily paper. Beyond leisure, the ability to read is necessary to accomplishing several daily tasks, from putting together a grocery list to paying bills to using street signs when navigating around town. The vision abnormalities caused by macular degeneration make it increasingly difficult for sufferers to read small type. A lighted magnifier enhances the size of font and an LED magnifier emits a gentler light than most lamps or overhead bulbs, allowing its user to read with ease while avoiding eye muscle strain. At the table. For many seniors, meeting with friends at a favorite restaurant for breakfast or lunch is a weekly highlight. But menus and bills with small print can quickly turn a fun day out into a stressful affair for someone with macular degeneration. The LED Magnifier is easily transportable, allowing its owner to pull it out discreetly while ordering and paying without disrupting the tableside conversation. Away from home. The freedom to travel is one of the joys of retirement, and today many seniors regularly take both domestic and international adventures by car, train, plane and cruise ship. While being away from home is exciting, it can also be overwhelming when a person with vision loss to be outside his or her daily routine. The LED Magnifier can be packed in a carry on and, as with outings at home, transported easily and used to illuminate and enlarge type on maps, street signs, menus and documents during travel, allowing the user to explore new destinations comfortably, while making memories that will last a lifetime. Peace of mind. Struggling to read the labels on your medication bottles? Guessing at the temperature of the oven as you pre-heat it to make dinner? One of the most frustrating aspects of macular degeneration is the way it disrupts everyday life, where we all need to perceive visual details to complete simple tasks. When vision loss begins to interfere with your ability to safely live independently, your loved ones may initiate a conversation about alternative living arrangements. Learning to use a lighted magnifier shows you are working hard to live a healthy life with macular degeneration, and using an LED Magnifier demonstrates your investment in environmentally friendly, long-term aid. Knowing you have the means to take care of yourself despite a macular degeneration diagnosis will provide your loved ones with peace of mind, and will allow you to live independently longer. Currently, there is no cure for macular degeneration. But with LED Magnifiers in their toolkits, seniors living with it can continue to lead rich, full and independent lives for years to come. For a limited time, if you enter the coupon code SLM15 at check-out you receive 15% off your order! Click here to see iMagniphy’s great products. Sources: Information on macular degeneration from the Mayo Clinic. 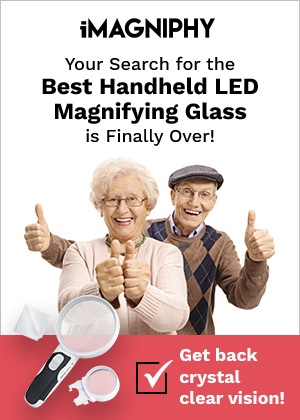 Information on LED and lighted magnifiers from imagniphy.com. Matthew has been interested in vision aid devices since realizing the incredible difference a new glasses prescription had on his life. He realized what an impact simple solutions can have and found that his grandparents immensely benefitted from the use of LED magnifiers. He has put significant time into researching the best solutions and helping to spread awareness.